Texans pass-rusher Jadeveon Clowney had a pretty rough rookie season, which was erased almost entirely by a series of injuries. He's currently recovering from microfracture knee surgery, and now he has to deal with an arm that was savaged by teammate D.J. Swearinger's pit bull. According to CBS Houston, Clowney went to the emergency room last week after Swearinger's dog tried to take a chunk out of his arm. Swearinger's dog broke the skin on the right arm of Clowney with the bite according to the report. Further investigation by the agency indicated the dog's vaccinations are good until early April. The bite was characterized to SportsRadio 610 by a member of the Pearland police department as a "minor bite" and no further medical information on Clowney was noted in the report. Pearland PD was alerted to the incident by the emergency room Clowney visited as they are required to report animal bites. The call was placed at 1:44 am. The pit bull was issued a standard home quarantine by the city which is consistent with any incident involving a bite according to Pearland PD. 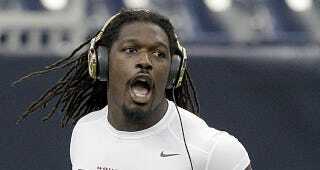 Swearinger and his brother both agreed to the parameters of the quarantine according to the documents. Pit bulls are cool dogs, but perhaps Swearinger should consider getting a less-violent take on the breed. We suggest he look into getting a dog like this little fella.